Impose: "The Strange Sounds of Activism at The Kitchen's S/N"
Cinema remains the last medium for speaking and performing love culturally. While much emphasis has been placed on the visual iconography of love, with the exception of music very little attention has been given to love as an aural phenomenon since the tradition and practice of amour courtois. 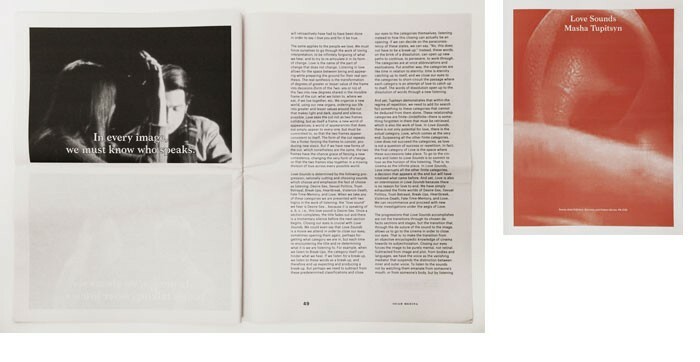 Partly inspired by Christian Marclay’s ontology of time in cinema, The Clock, and René Magritte’s word paintings, which textualized the visual tropes of painting with “written” images, Love Sounds, a 24-hour sound poem and montage, dematerializes cinema’s visual legacy and reconstitutes it as an all-tonal history of critical listening. 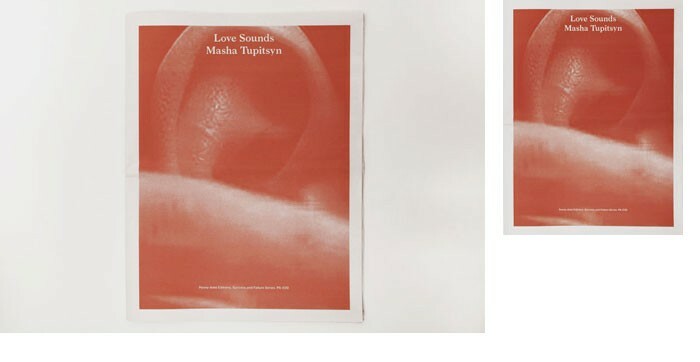 Love Sounds, a 24 hour audio history and essay of love in cinema, concludes Tupitsyn’s immaterial trilogy. 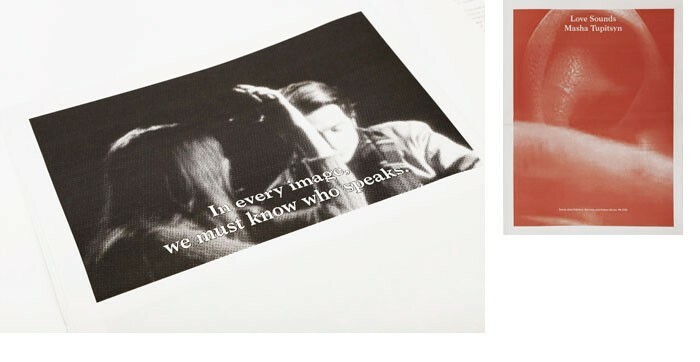 The film is accompanied by a catalogue published by Penny-Ante, featuring written works by Masha Tupitsyn and contributors McKenzie Wark, Berit Fischer, Isiah Medina, C. Spencer Yeh, and Yaniya Lee. In 2011, Tupitsyn commenced her immaterial series with LACONIA: 1,200 Tweets on Film, the first book of film criticism written entirely on Twitter. LACONIA experimented with new modes of writing and criticism, updating traditional literary forms and practices like the aphorism and the fragment. 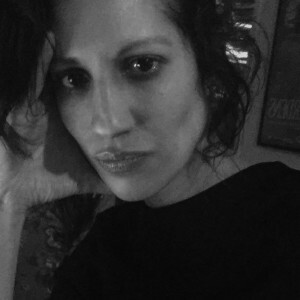 Re-imagining the wound-and-quest story, the love narrative, and the female subject in love in the digital age, Love Dog, published in 2013, was the second installment in Tupitsyn’s trilogy of immaterial writing. 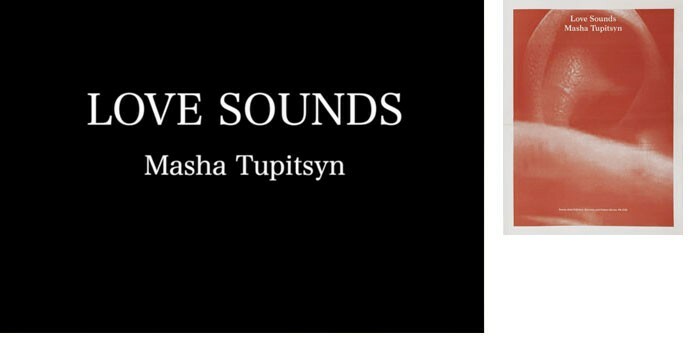 Written as a multi-media blog and inspired by Roland Barthes’ A Lover’s Discourse and Mourning Diary—a couple in Tupitsyn’s mind—Love Dog is an art book that is part love manifesto, part philosophical notebook, part digital liturgy. In ways perhaps not completely anticipated by Michael Chion in his advocacy of “masking methods” of research into film sound, Masha Tupitsyn’s extreme and beautiful experiment with “acousmatic listening” in her astonishing video-work Love Sounds sets out constitutively to break the synchrestic audiovisual contract of sound and image. This monumental work succeeds in pointing up not only the expressive worth of audiovisual essays for audio/visual studies, but also their performative and experiential potential. As I have written before of the “sensuous methodologies” and forms of videographic film and moving image studies, it is precisely because, audiovisual essays, unlike written texts, “don’t have to remove themselves from film-specific forms of meaning production to have their knowledge effects on us [that] we can feel, as well as know about, the comparisons these videos enact. […].” It is their affective and phenomenological added value that convinces me not only that digital videographic studies of audio-vision are here to stay, but also that we can’t yet begin to guess at all of the very interesting places to which they might take our discipline. Turning up the volume of such studies, in coming years, sounds like a deeply audio-visionary prospect. Masha Tupitsyn is fascinated by film. The young New York artist has gathered 1500+ love scenes from 80+ years of English- speaking cinema history. 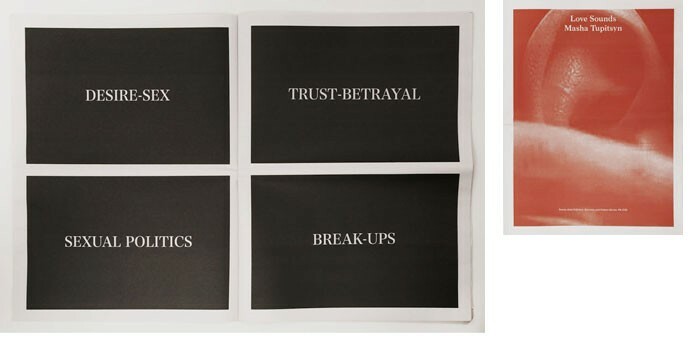 However, nothing is seen, only heard—Tupitsyn has an archive of breathy or stammered declarations of love created and divided into eight sections, from desire to undying love. A Hörmarathon 24 hours, and at the same time a remarkable Kopfkino because the missing pictures automatically paint themselves. July 28 – Aug 27, 2017: “You hardboiled I softboiled” at Rhubaba Gallery (Edinburgh) with Rosalind Nashashibi, Valerie Norris, Sam Riviere, Masha Tupitsyn, Claire Walsh, and Jessica Yu. “You hardboiled I softboiled” is part of the Edinburgh Art Festival and the ROSL Visual Arts Scholars programme.